With bullets flying past them, a team of medics worked desperately to save the wounded policemen, and were honored today for their efforts. While a firefight raged near the Temple Mount during the terror attack earlier this month, Magen David Adom (MDA) paramedics Aharon Adler, Yisrael Weingarten, and Aharon Shteinmetz struggled desperately to save the lives of two wounded policemen, Haiel Sitawe and Kamil Shnaan. All three were promoted Monday in a ceremony honoring their poise under fire. "The horrible attack on the Temple Mount still reverberates" said MDA CEO Eli Bin. "During the attack, I received many reports, and looking back at the incident, these men are heroes." "Those from MDA who took did their part and treated the injured are amazing people" continued Bin. "The attack was handled professionally, and I admire the paramedics and volunteers who helped out." 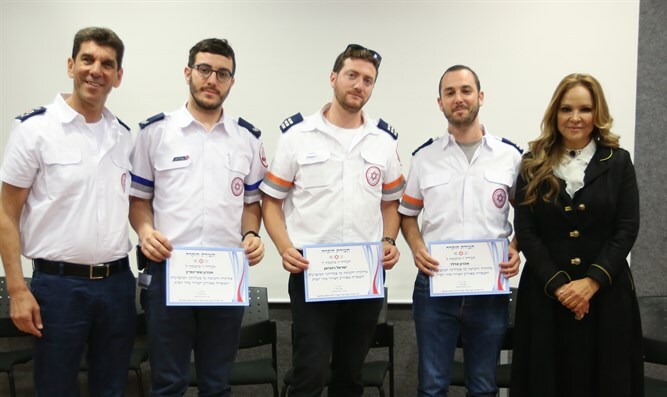 The ceremony took place at MDA's Jerusalem headquarters, in which the three were handed certificates of appreciation by CEO Bin, and were promoted to a higher rank. Aharon Adler was singled out for praise, due to his refusal to leave the scene despite being wounded by friendly fire. "We are in the middle of treating the policemen, when suddenly Adler told me that his foot hurt" recalled Weingarden." Leave me be, lets continue treating the wounded," Adler said. "In medical terms, I was only lightly wounded" said Adler. "I decided to first deal with those seriously injured, and only then to worry about myself." Adler only allowed himself to be evacuated for treatment after he finished treating the rest of the wounded.